The monitor was 'okay.' I wasn't expecting superb color or anything like that out of the box since it used a TN panel afterall. The colors were sort of over exaggerated, not sure if it was the default contrast settings or what. However, I was pleasantly surprised to find out that the monitor can be overclocked to 74 Hz after 1 minute or so of fiddling around. Awesome picture for a TN panel. I picked this monitor specifically because it had built in speakers. 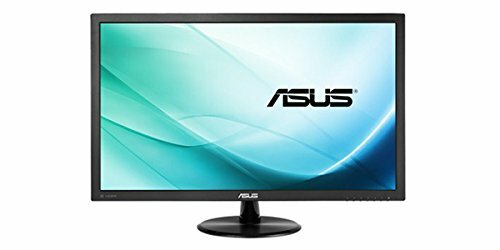 Kind of overpriced but it's a pretty alright monitor. I didn't realized when I ordered it that it was an LCD. But works fine. 1ms response time on it, wanted to make sure I didn't get any ghosting. Does the job well, and played on it for over a year. Good size as well. This had been the main monitor since 2015. Bought this as a replacement for the similar Asus VH247. I had come home, saw that the wind had blown the window down, hit a speaker which knocked the monitor off of the desk. Screen a bit scratched and I was worried it was going to fail. So, I ordered this immediately. Long intro. TL;DR This was/is great for gaming. 1ms response time, colours crisp. I mean, it's a 60Hz 1080p monitor. I like it and it's likely cheaper these days.